Until recently the RAF’s AAR fleet mainly comprises 15 x VC10 K3 and K4 aircraft flown by No 101 Squadron based at RAF Brize Norton. These were supported by 8 x Tristar K1/KC1/C2/C2A (216 Sqn, Brize Norton) aircraft used for both transport and AAR. The RAF AAR capability is the most specialised in NATO, and has been extensively deployed in recent allied coalition operations in Afghanistan, and Iraq. From 2014 onwards RAF AAR operations will be undertaken by A330 Voyager aircraft. On 27 March 2008 the UK Ministry of Defence signed a deal to lease 14 aircraft under a PFI agreement from the EADS-led consortium AirTanker Ltd. This PFI contract is based on the firm assumption that the FSTA aircraft are both operated from, and maintained at RAF Brize Norton. 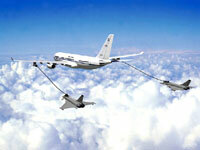 The AirTanker consortium comprises Cobham, EADS, Rolls-Royce, Thales and VT Group. The Airbus Military division of EADS were responsible for designing, developing and converting the tankers based on the Airbus A300-200 aircraft, and for delivering the completed aircraft to AirTanker. FSTA (now Voyager) will replace the in-service Tri Star and VC10 aircraft. There are two versions: Voyager KC2 fitted with two Cobham 905E under-wing refuelling pods and Voyager KC3 fitted with a Cobham 805E Fuselage Refuelling Unit in addition to the under-wing pods. Voyager is powered by two Rolls-Royce Trent 772B-60 engines. Voyager will probably remain in service until about 2040, and the aircraft will refuel combat aircraft such as the Tornado, Typhoon and the F35B which will enter service during the next decade. In its air-to-air refuelling role Voyager has the ability to offload 60 tonnes of fuel 1,000 miles from base, and remain on station for 2 hours. On a typical deployment over about 3,000 miles, a single A330 would be able to refuel four Tornados and still carry 11,000lb (5000kg) of freight and/or 290 passengers. The in-service date for Voyager is May 2014 when nine of the 14 aircraft on order will be available for AAR operations. The PFI payment terms means that the MoD will only pays for the service delivered depending on number of aircraft booked per day, and hours flown..